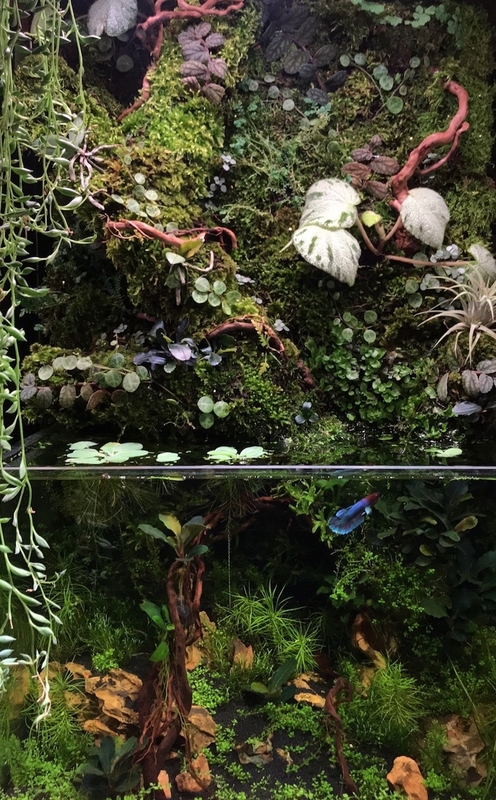 This aquarium with a living wall behind was inspired by the film Avatar (note the blue fish). Photograph: James Wong. I had so much fun and fascinating stuff to chat about with expert botanist and houseplant maverick James Wong (aka @botanygeek on Twitter and Instagram) that I am bringing you another chunk of our chat this week. We check out his incredible waterlily nano pond made from a glass fruit bowl, his Avatar-inspired aquarium and living wall, his fishbowl terrarium and more. If you haven't yet listened to part one of my visit to James Wong's flat, please do so before you click play on this episode: it will make a lot more sense that way! The show notes below will fill you in on all the plants, shops and products we discuss in the episode, so do scroll down as you listen. And finally, just a reminder that the other voice in the interview is garden designer and fellow London-based plant genius Rob Stacewicz (he's on Twitter @RS_MCIHort). I love being able to bring you all this great info for free, but On The Ledge podcast isn't free to make. Huge amounts of my time and a chunk of my own money goes into putting the show together, editing, website hosting, equipment and so on. If you would like to support On The Ledge by pledging $5 a month via Patreon, not only do you help keep the show going, you also get exclusive extras. That includes an interview with James in his bedroom about his Tillandsia display, mounted staghorns and his incredible new hi-tech Biopod microhabitat. Sign up now to access this right now along with much more exclusive content, including Summer Rayne Oakes on pest control and Dale Martens on breeding Streptocarpus. Never come across Patreon before? Check out my Patreon FAQ to find out more. James repurposed a damaged tank that no longer held water as a Jurassic Park themed terrarium. Can you spot the dino? 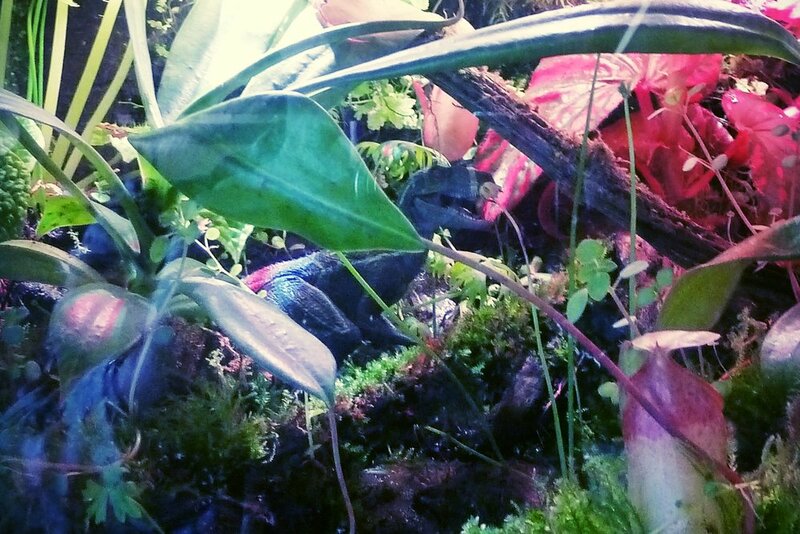 James included two unusual Begonias and two unusual Nepenthes that require constant, near-100% humidity in the tank. The only piece of 'kit' in this tank is a mini-water feature with a pump bought on Amazon for a fiver to keep plants moist. James got pulled up by his friend Rob for having too many pots dotted around his windowsill, so he planted them in windowboxes instead. James's approach is that plants grow better together, so he crams them into windowboxes. One benefit of this is increased humidity to the grouped plants. The windowbox troughs came from Getpotted.com: James mottled them with paint to gain a lighter shade of grey. He just uses houseplant growing medium but just adds some perlite to the mix. The troughs don't have drainage holes, so James has to be a little careful with watering, but he finds that individual pots dry out so much quicker, so in many ways this is less work than loads of individual pots - what James calls 'the Instagram model of houseplants'. The houseplants when potted together will 'style themselves' says James, moving to accommodate each other. The houseplants he uses successfully in this way are many and varied but include Peperomia angulata, Alocasia reginula, Pilea libanensis (aka glauca), Begonia maculata, Pilea peperomioides, and the delta maidenhair fern, Adiantum raddianum. James had always wanted to grow waterlilies indoors so when he discovered a teeny tiny waterlily with a 30cm width, he decided to have a go at growing one in a glass fruit bowl for fun (as you do!). He tweeted his creation and it went viral. "My phone was going off like a defibrillator," James says. Here's his original tweet. The nano pond was made from an IKEA fruit bowl James had in his rented flat. IKEA (in the UK anyway) don't seem to sell a glass fruit bowl with a 30cm diameter any more, but you can buy a 20cm one. If you want to go a little bit more fancy you could get this crystal bowl. The waterlily James grows in this nano pond is Nymphaea helvola. It has now flowered! For more on waterlilies as houseplants, check out this article James wrote for the Observer last year. You can buy this waterlily from various places in the UK, including Crocus. Other aquatic plants used in these nano ponds are Anubias pangolino, Bucephalandra and Pogostemnon. The pond is placed under a lamp with an IKEA grow light. The most frequent question James receives about the nano pond is water quality - he changes the water - or rather a couple of mugfuls of the water - once a week and that's it. Oh, and he uses tap water rather than distilled or anything else. Then he wondered how small he could go, so he made a 300ml glass bowl. In theory, the smaller the vessel, the harder it is to maintain but so far it's the one that he has to change least. James sources his aquatic plants from two main UK suppliers, ProShrimp and Aquarium Gardens. Read more about James's experiences with aquatic plants in this article for The Observer. Just like his other houseplants, James decided to grow his succulents in a trough on the windowsill. This way you don't have to water lots of individual pots, and the result is stunning. James sourced his succulents in trays from Columbia Road flower market in London. Watering needs to be measured as there is no drainage in the trough. James says: "I love Tillandsias, and in theory they are very low maintenance, but for me for some reason not all of them grow very well. 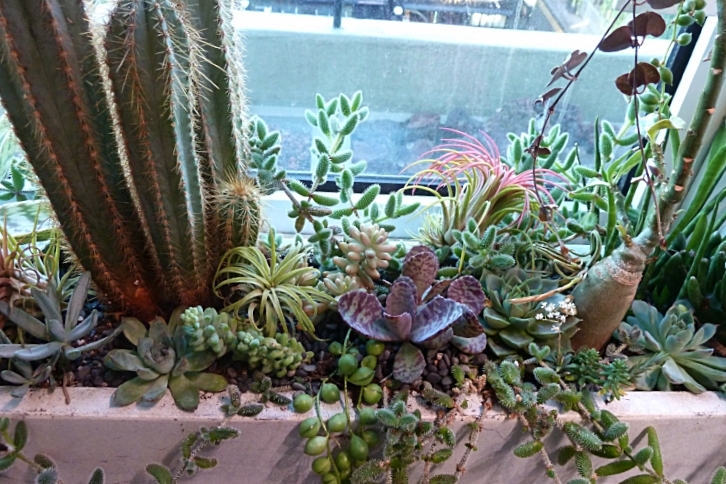 I had some gaps in this cactus window box and I just shoved some in, I thought they might benefit from the indirect humidity that's rising up. This is the only time that my Tillandsias not only survive, but the true measure that they are growing really well is that they have babies. So my tip for Tillandsias is to stick them on top of pots so they benefit from the humidity around them." James decided to make a take/living wall arrangement with a blue theme, in honour of the film Avatar. James gets all his begonias from Dibleys Nurseries in North Wales. The silvery one featured on the living wall is one James and I both find relatively easy to grow - it is B. 'Silver Jewel'. There is one blue fish in this tank - it is a Siamese fighting fish - plus some blue freshwater shrimp. The living wall is designed to go above and below the water. The blue theme continues with an iridescent blue Selaginella uncinata aka peacock moss or spikemoss and a bluish Bucephalandra. My attempt to create the towering limestone pinnacles, covered in lush palms of ‘Kong: Skull Island’ in miniature. Just annoyed you can’t see the rock face detail & tiny jungle vines. James decided to make a terrarium in homage to Kong: Skull Island using some unusual plants. 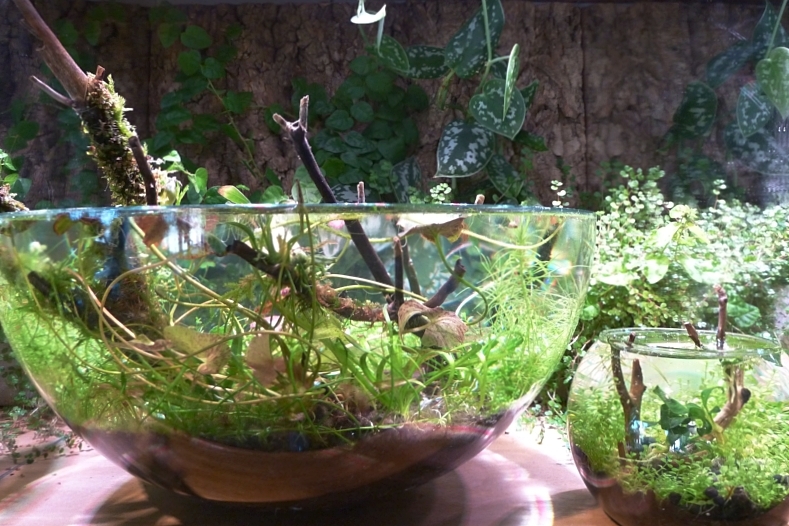 This terrarium is made from a 45cm wide glass fishbowl. The plants that look like mini-palms are Biophytum sensitivum aka the little tree plant, a relative of Oxalis - James got his from N1 garden centre in London but you can also get them from Dartfrog.co.uk and other vivarium plant stockists. All the other plants in the terrarium are aquatic plants. They are glued using aquarium glue to pieces of dragonstone, which can be bought from aquascaping stores. "f you have a blank wall with some light you can garden," says James. He brightened up a plain wall with picture ledges containing narrow plant troughs, lit by IKEA grow lights. The narrow but mall troughs made from concrete came from Clifton Nurseries in London. The picture ledges come from IKEA. The plants are lit using IKEA grow light bulbs and mirrors help to bounce the light around. 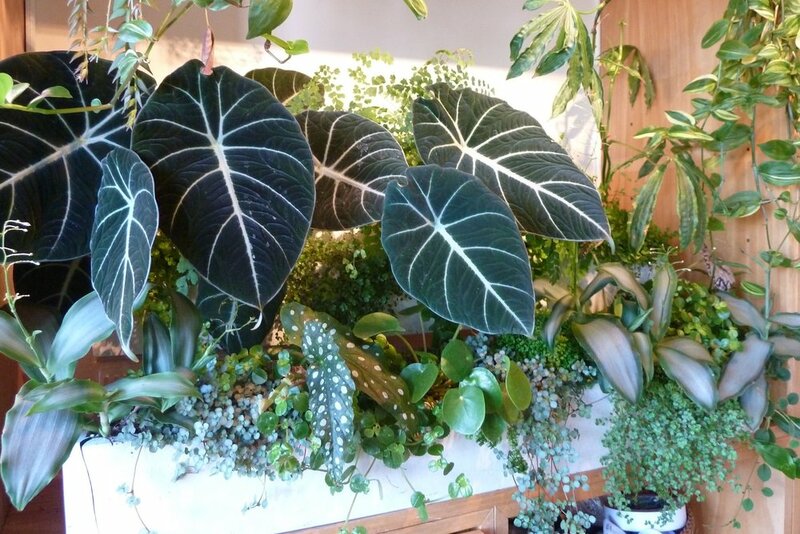 Plants featured here include satin pothos, Hoya linearis, Columneas and Peperomias. The cissus James mentions is Cissus rotundifolia aka Peruvian grape ivy. Springtails in action. Photograph: Jean and Fred via Flickr. Listener Stephanie wanted to know what the tiny, silvery-grey jumping bugs in her houseplant compost were - they are most likely springtails, which is good news because they aren't a major pest like the spider mite. They feed on algae, fungi and mould rather than living plant tissue, so are one of nature's clean-up crews. However, the presence of springtails can be a sign that your plant's growing medium has been overwatered. It's worth taking the plant from its pot, checking roots and healthy and repotting into fresh growing medium. If you use sterile growing medium when repotting, you shouldn't have a problem with springtails. Here is a video of some springtails if you want to take a look (turn down the sound if you don't like the dance music soundtrack!) and if you want to find out more about culturing springtails and other isopods for terrariums, vivariums and so on, check out this page from Glass box Tropicals. Want to ask me a question? Tweet @janeperrone, leave a message on my Facebook page or email ontheledgepodcast@gmail.com. There's an episode about moth orchids coming soon, so I'd particularly like to hear from anyone with a Phalaenopsis problem to solve. On the evening of Friday October 26 I'll be bringing a live show of On The Ledge to the RHS London Urban Garden show, with special guests including Alys Fowler and all kinds of leafy fun! Put this date in your diary NOW! This week's show featured Roll Jordan Roll by the Joy Drops, An Instrument the Boy Called Happy Day Gokarna by Samuel Corwin, and Plantation by Jason Shaw, all licensed under Creative Commons.